This week we celebrate Thanksgiving day here in the United States. I love Thanksgiving! In fact, I love both the day and the act of giving thanks! In the fall of 2009, I began keeping a gratitude journal. Each day since I began I try to write down at least three things I am thankful for. It has been life-changing for me. To me, there is no greater tool against hopelessness than thanksgiving and praise. Gratitude journaling has helped me to see God's daily faithfulness in my life, even through the difficult things that I've experienced in the past seven years. Some days, as I write in my gratitude journal I don't "feel" thankful. You've heard it said that love is more than an emotion, it's a choice. We choose to love even when our emotions don't feel loving. The same is true for thanksgiving. We choose to give thanks and to praise God even when we don't feel an accompanying emotion. When we choose to do loving actions, the emotion of love follows. Likewise, when we choose to give thanks even if we don't feel anything, the feeling of gratitude and the desire to praise will often follow. When I think about choosing to give thanks, I am reminded of my husband telling me about an experience he had on his last visit to Ghana, West Africa. He said that every morning he would be awakened by the sound of a woman singing praises to God. He went out on the porch of the retreat center where we stay when we go to Ghana, and across the rutted clay road he saw the neighbor woman scrubbing her laundry by hand while singing her thanksgiving and praise. We happen to know a bit of her life story. There are many who might say that she has no reason to give thanks, and yet every morning that's how she begins her day. Don't put off thanking and praising God until everything is going great in your life. Start right now, right where you are, right in the messy reality of your real life. It's not hard, in fact, it might be as simple as, "thank you, God, for this hot cup of coffee". If you keep it up, gratitude will become your default mindset. Everyday will be thanksgiving for you...minus the turkey and pumpkin pie, that is! So this is my challenge for you. Grab a notebook or journal and give gratitude journaling a try. It's like writing a daily thank you note to God. 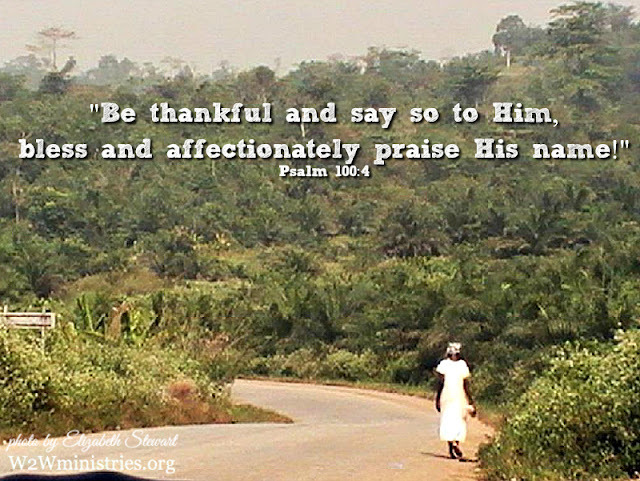 Be thankful and say so to Him. Absolutely right on the thankfulness. Love the idea of a thankful journal. I've always been a Christian, but not always a practicing one. Since I've rededicated my life to being more of a Christian, reading the Bible daily since 2014 (I'd never really actually tried doing that much before then) and just thinking of all the wonderfully, simple little things in life that are a gift. With seeking to have God in my life, I see things differently than when I just called myself a Christian. I'm learning. As the lady you mention, sometimes I see people that just seem so happy just to be blessed with the unseen blessings vs material blessings that we've become accustomed to, and they are genuinely happy. Sometimes I just thank God for his lovely blue sky and even the chilling winter snow. It tugs at the heart some days to see the beauty of it all. I am so excited to read about the recent growth in your relationship with Christ! Isn't it wonderful to be able to look at the beauty around us with appreciation and a real relationship with the One Who created it all!